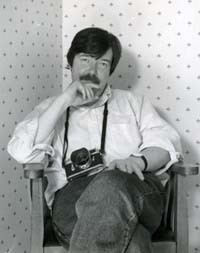 Peter Turner, photographer and editor: born London 3 February 1947; died Wellington, New Zealand 1 August 2005. From The Independent, 9th August 2005, written by Paul Hill. Peter Turner was editor of the highly influential British photographic magazine Creative Camera in the 1970s and 1980s. His editorial direction consolidated Creative Camera’s role as the leader of Britain’s “photographic culture”, following the departure of the founding editor, Bill Jay, who had established its Modernist/Formalist agenda in the late 1960s. Its influence during this time was so pervasive amongst “independent” photographers world-wide that even American photographers – the trendsetters then of photography as art – read it to see what their American peers were up to. He was appointed assistant editor of Creative Camera in the early 1970s by its eccentric proprietor, Colin Osman, who subsidised the magazine via his pigeon-racing publications. Turner took photographs of pigeons for these, subbed copy in the mornings (as I recall) and spent the afternoons looking at photographers’ portfolios and gave words of advice and encouragement to aspiring “creative” photographers. His advice was always carefully considered, gently spoken, well meant, and useful – a remarkable gift for someone who was then only in his early twenties. In 1973 he co-curated with Sue Grayson the exhibition “Serpentine Photography”, one of the first surveys of young contemporary photographers, held at the Serpentine Gallery in London. Although Turner continued to make pictures (he was one of the exhibitors in “Singular Realities”, at the Side Gallery, Newcastle upon Tyne, curated by his friend and collaborator Gerry Badger in 1977), his strengths were as an eloquent advocate of the new “independent” photography as his written commentaries and critiques attest. During his editorship, photographic imagery rather than photographic theory was centre-stage as he thought that too much critical analysis was “doomed to failure before it starts”. Postmodernism exasperated him and he was ambivalent about photography’s role in conceptual art. William Messer wrote at the time in US Camera Annual that Turner was one of “the three key people in photography’s developmental hierarchy in England”. Turner’s successor as Creative Camera editor, David Brittain, wrote in 1999 that this period in the magazine’s history “was the result of a complex meshing of cultural, economic and market forces with strong personal convictions (and) not solely the progeny of photographic Modernism” as persuasively preached by the excessively influential John Szarkowski, the then curator of photography at the Museum of Modern Art, New York. In 1980 Turner set up, in Putney, Travelling Light, a photographic publishing business, with his partner, Heather Forbes, who had worked in the Photographers’ Gallery bookshop in London, and was a talented photographer herself. But being a hard-nosed businessman was not in Turner’s nature and the business was plagued by financial and printing problems, although the couple did some memorable pioneering work in difficult times. In the end it went bust. So in 1986 he responded to Colin Osman’s invitation to resume his former position at the magazine, which was to be overseen by a board of trustees rather than by Coo Press. Colour photography made its belated debut in the magazine around this time and Turner happily championed the emergent polychromatic talents of photographers like Martin Parr, Paul Graham, Anna Fox and Peter Fraser. He was not always pleased, however, with the way that photography had become the preferred medium of fine artists who were ignorant and unimpressed by the traditions and history of photography. He was a photographic purist at heart, but as editor he always fought against ghettoising the medium and encouraged contributors to offer challenging and diverse viewpoints to his own. With the burgeoning number of photography courses, academics, events and platforms came debates concerning the future directions of photographic practice and the seeming Modernist orthodoxy of Creative Camera and its relevance in an ever-changing, monetarist world. Turner was asked to manage the magazine as well as oversee it editorially. The strain was too much. He was a born editor and proselytiser who had too much Sixties’ rebellious spirit, as well as nicotine and lager, in his veins to become “a suit”. He was not strong physically either and the years of struggle began to show. In 1991 he quit the magazine and Britain, and decamped to New Zealand, Heather’s homeland. There he got back his enthusiasm and started to lecture at local colleges and write regularly for The NZ Journal of Photography. Despite being diagnosed with multiple sclerosis, he continued to teach and write with the sort of conviction and humour that always made something he wrote – even a humble postcard – a joy to read. Although he was the author of several books – the best known being American Images 1945-80 (1985) and The History of Photography (1987) – and an expatriate for over a decade, he will always be remembered for the “creative years” of Creative Camera.